What is Real Magic? The base is called “iso-something or other”. Heck, it may be French for all I know. 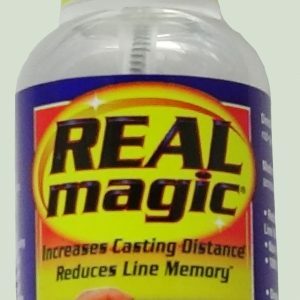 But I do know it works and it has UV inhibitors that protect my line and gear.A lot of anglers ask me how often I use Real Magic. I like to spray my line (monofilament, fluorocarbon and braided) before my trip. This allows the formula to soak in. Then I spray it a couple of times during the day. 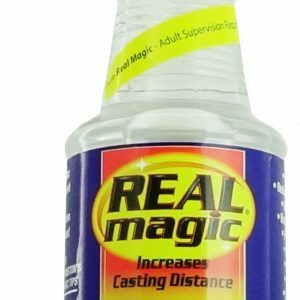 Real- Magic lasts longer than that watered down stuff the imitators make. 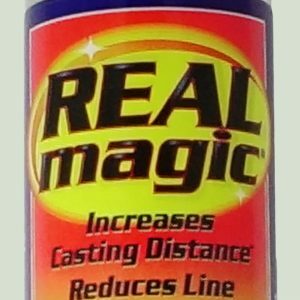 There’s no smell after it dries too.Since it reduces friction; I believe that Real Magic also increases line life.I’m still surprised how many uses we’ve found for Real Magic. It isn’t slimy or greasy after it dries, so it doesn’t attract dust. It makes an excellent, light lubricant for bail-hinges on your reels. It protects my vinyl seats and dash on my boat. It cleans and protects the connections on my depth-finders. Thanks to its no-water formula; Real- Magic is safe for gun actions and the pulleys on my bow. There’s no smell after it dries too. I’ve got a buddy that wipes Real Magic on his laptop screen. He swears it kills the static and it stays cleaner, longer.If you haven’t tried Real Magic, test it yourself. The stuff’s so good, they guarantee it!Note: We’d like to congratulate Jimmy and Chris Houston on their induction into the Legends of the Outdoors Hall of Fame. We’re proud of you guys!